We often say “God works in mysterious ways,” but if we don’t actually look back and see God woven into our lives or we miss the ways God’s hand has been guiding us, then it will actually remain a mystery and even may not see the blessings that we have received. We also like to focus on the blessings in others’ lives, when we check our Facebook and Instagram, and compare our lives to our friends lives in pictures and posts. When we only read the good and fun posts or see pictures of their constant smiling faces and perfect families, our lives may look dull and boring, or even out of control. God takes us all on a different journey, so it is unfair for us to compare the blessings God has given to others with the ones He has given to us. Instead, we must be happy for the blessings others have, how wonderful that our God is loving and merciful to everyone, and not just us alone! Again, this may be difficult when we are facing a difficult situation or large loss, but if we don’t see the blessings then we could fall into depression and grow apart from God. Seeing God’s work in our lives is also difficult as mothers, fathers, workers, or whatever it is that comes because us and God, because we are distracted by other things or people around us. We see how others are able to keep it all together, while we feel like we are falling apart. We have lots of crosses to bear, but we must take time to see the blessings rather than always focus on the daily struggles. What can we do to keep close to God and see how He is working? “Therefore I tell you, do not be anxious about your life, what you shall eat or what you shall drink, nor about your body, what you shall put on. Is not life more than food, and the body more than clothing? Look at the birds of the air: they neither sow nor reap nor gather into barns, and yet your heavenly Father feeds them. Are you not of more value than they? And which of you by being anxious can add one cubit to his span of life? And why are you anxious about clothing? Consider the lilies of the field, how they grow; they neither toil nor spin; yet I tell you, even Solomon in all his glory was not arrayed like one of these. But if God so clothes the grass of the field, which today is alive and tomorrow is thrown into the oven, will he not much more clothe you, O men of little faith? Therefore do not be anxious, saying, ‘What shall we eat?’ or ‘What shall we drink?’ or ‘What shall we wear?’ For the Gentiles seek all these things; and your heavenly Father knows that you need them all. But seek first his kingdom and his righteousness, and all these things shall be yours as well. “Therefore do not be anxious about tomorrow, for tomorrow will be anxious for itself. Let the day’s own trouble be sufficient for the day. 3. Pray – you must keep that constant communication up with God, no matter what! We all have those people who we can talk to no matter what is going on in our lives, the good, the bad and the ugly. God is that friend. He wants to hear from you when you are struggling or suffering, but He also wants to hear from you during the good times. Also, remember to be thankful in all that you have, even in your struggling as a mom. 4. Pray to the saints – The saints are our friends in heaven, and they also want us to get to heaven. God shares the saints with us as examples of faith, as sinners who understand what we are going through. Find a saint who you can relate to, and find a prayer or statue or prayer card, and place it somewhere you will see them everyday. 5. Take Time – We must take time to look at our blessings, otherwise we focus only on our crosses. Another load of laundry vs. we are so blessed to have these clothes or maybe we should bless another family with some clothes! I can’t keep this house clean vs. thank you God for this beautiful home. Where can you change a cross into a blessing? 6. Have a support system – your spouse, friends, family, faith groups. This is important to have others in your life to help you see your blessings, especially when you are getting down and not seeing those blessings. 7. Open the Bible – The best way to see how God blesses people is through what He has done for His people in the Bible. Also, reading and understanding the words and teaching of Jesus. Like, John 6:27 “Do not labor for the food which perishes, but for the food which endures to eternal life, which the Son of man will give to you.” – in other words, the things of this world are fleeting, it is the work that we do for the eternal is what matters. Labor for Jesus! 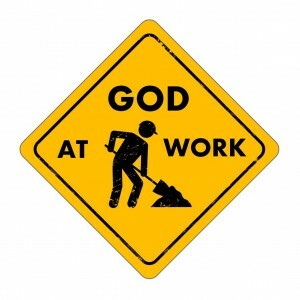 Where has God worked in your life? How has God brought you and your family closer to Him? How do we find our blessings? blessing, catholic, Catholic Upgrade, God's work, simple upgrade, testimony. Bookmark.